EDITOR'S NOTE: David Johnson is the son of Anne Cade Kester and the late James Cade. David is a 1987 graduate of Eufaula High School. BLOOMINGTON, Ind. -- David Johnson has been appointed vice provost for enrollment management of Indiana University Bloomington, Provost and Executive Vice President Karen Hanson announced today. 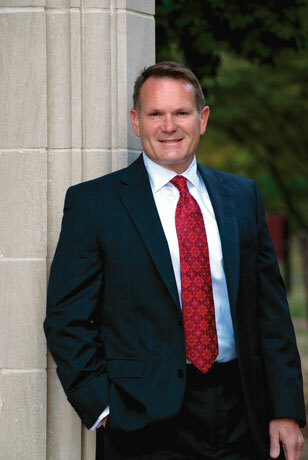 Johnson has been interim vice provost for enrollment management since May 2010. He succeeds Roger Thompson, who left to become vice provost for enrollment management at the University of Oregon. "David has played a key role in the progress that the Office of Enrollment Management has made in recent years," Hanson said. "He knows the campus and understands the relationship between academic excellence and effective management of admissions, financial assistance and other student enrollment functions. It is gratifying, after a nationwide search, to be able to appoint one of our own to this crucial position." Johnson was IU Bloomington associate vice provost for enrollment management until being named interim vice provost. He said he accepted the new appointment with gratitude and excitement. "I am delighted to have this opportunity to work with colleagues in Enrollment Management and with students, faculty and staff across the campus as we move forward to meet our strategic enrollment goals of quality, diversity, international breadth and affordability," he said. "In Enrollment Management, we recruit and serve promising students who will be engaged in the classroom, on campus and in the community and who will persist and graduate. We must do all that we can to honor the commitment we all share to IU's continued excellence." Johnson was one of four finalists selected by an IU Bloomington search committee. The four were on campus in November 2010 to meet with administrators, staff and students and to take part in public forums with members of the campus community. "The search committee was particularly enthusiastic about David Johnson's commitment to enhancing our success in four areas: recruitment, retention, engagement and graduation," said committee chair Jean Robinson, professor of political science and associate dean for faculty and academic programs in the College of Arts and Sciences. "His experience at IU and his expertise in research-driven enrollment management mean that he will continue IU Bloomington's strong push to recruit and retain extraordinary students from across the state, the nation and the globe." Before coming to IU in 2007, Johnson was director of enrollment services and programs and held other positions at the University of Alabama, Tuscaloosa, and was an administrator at Troy University in Dothan, Ala. He has a bachelor's degree from Troy, a master's from Auburn University and a doctorate in higher education administration from the University of Alabama. As associate vice provost at IU Bloomington, Johnson had responsibility for budget and resource planning, human resources, systems design and development, 21st Century Scholars recruitment, interactive communications, scholarships, and enrollment research. He has also worked on recruiting, marketing and programming initiatives that seek to attract academically talented students to IU. He has been a frequent presenter at national and regional conferences around the country. He has published and presented regularly on generation Y, student persistence, student recruitment, data mining, predictive modeling in student recruitment, and other topics related to student services. The vice provost heads the Office of Enrollment Management, which includes the offices of admissions, enrollment planning/research, first-year experience, the registrar, scholarships, student financial assistance and systems design and development. Enrollment Management works to attract, admit, enroll and retain students; create and manage a campus schedule, course offerings and academic records; administer scholarships and financial aid; facilitate student transitions; and promote Indiana University and higher education. For more information, see http://www.indiana.edu/~oem/index.php.